You're a well-meaning grandmother, not a demanding bully who gives your adult kids a hard time. But do you get the distinct sense that your adult kids are keeping you out of the loop? Several weeks ago, Lisa posted a questionnaire on Grandma’s Briefs surveying the satisfaction level amongst grandmothers. I noted that most grandmothers who answered her survey (including myself!) expressed satisfaction in their roles. But not all grandmas are this positive. At my website for struggling mothers-in-law, I've received emails from fellow MILs asking how to cope. Some MILs report that their DILs don't bring the kids over. They complain that their DILs are cold and aloof. I’ve received emails from DILs, and I'd say most want to be close with their children's grandmothers but have found that doing so sabotages their emotional well-being. Do you recognize yourself in any one or more of the following MIL types? I offer advice for each. 1. The Advice Giver. If you try to "fix" the situation for them, through advice, they may refrain from sharing with you in the future. They are coming to you to vent. Be their mom and confidante — a loving shoulder. 2. The Worrier. Your son shares with you that their daughter got a bad grade on her report card. After you hang up the phone, you worry. You can't let it go. Their child's school situation has now become all about you and your anxiety. This is going to be challenging for your married children, and they may opt out of sharing with you details of their child's future school progress. Trust that your children have the resources to deal with their challenges. 3. The Gossiper: Your DIL tells you she is expecting a baby. She asks you to keep it a secret for now. You "just" tell your best friend, or sister, cousin or co-worker. Sooner or later, your DIL will get wind of the fact that you lack discretion. She will lose trust, and stop sharing. If you want your kids to keep you posted, keep their secrets safe. 4. The Platitude Sayer. When your adult kids share with you about an issue, you state broad cliches such as "it's all for the best," and "this too shall pass." Stating platitudes when your adult children are suffering may make them feel frustrated. Although you mean well, this is not what they need from a mom. They simply need empathy and caring in the form of "I understand," or "This must be hard." Be personal and warm. 5. The Follow-Up-er. Remember when the kids were small and they'd study for a difficult test? Your instinct was not to ask the very next day about the results of the test. When your child was ready, he or she would share. When our child (or grandchild) shares with us about something, we don't need updates and play by play about the situation. Give them space. When they share something exciting, don't expect constant follow-up. 6. The Minimizer. I once knew someone who was struggling with infertility. She told me that the one thing she hated was when people said to her, "Oh, you'll see. You'll have a baby one day." My friend was frustrated because in her mind, she felt they were minimizing the situation. With your married or adult children, if they share a pain with you, try not to oversimplify their pain with comments such as "Oh — it will all work out." Better to say, "I'm sorry you are going through this," or "Is there anything I can do for you?" Do not minimize someone else's situation. 7. The one who doesn't "get it." For the generation gap, kids now say, "oh, you just don't get it." Your son calls you up to share how Johnny got into a squabble with a kid in the class. You make broad suggestions, indicating you are clueless about the current system (school, social, children's behaviors, social appropriateness). When they talk, listen to their point of view. Realize that things are done differently these days in schools and societies. Ask questions if you have to, but don't offer input based on your own preconceived ideas of how things were when you were raising your kids. 8. The Blamer. You listen to a problem, and immediately toss blame on someone. This is your way of finding a neat solution to the problem — except that it doesn't solve anything. You may blame a teacher of your grandchildren, a parent of one of your grandchildren's friends, or even the parenting skills of your own children. Support. Empathize. That way your children will feel safe and involve you in their world. Which is the best thing for a well-meaning grandma to do! 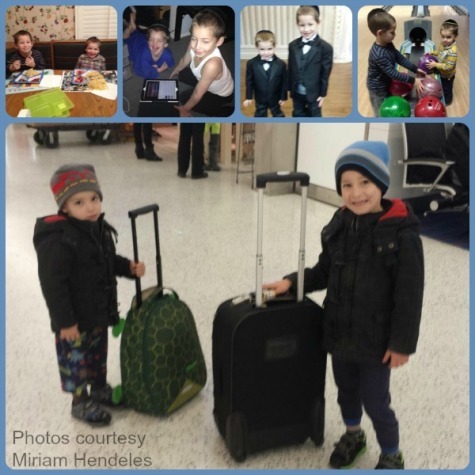 Miriam Hendeles, MT-BC is a music therapist, writer, blogger and the author of a book on being a grandmother to her four grandsons, Mazel Tov! It’s a Bubby! (The Joys and Oys of Being a Mother, Mother-in-law…and Grandmother). Her blog is Bubby Joys and Oys and her website is Mother-in-Law-Hood 101. MIL’s who visit that site will get ideas of how and when to speak up, keep quiet, cope and survive in their challenging roles as mothers-in-law. Miriam lives in Los Angeles with her husband and sons. Do you see yourself in any of the above — with in-laws or your own children?